From the front of the choir: Hey, you at the back! 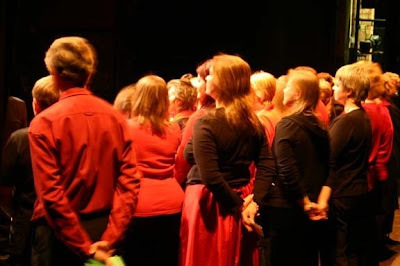 Unless you’re in a fairly small choir which can rehearse in a circle, there is usually more than one row of singers, especially in concerts. Typically taller singers stand on the back row, and shorter singers at the front. I also encourage those who don’t know the words off by heart to stand at the back as it doesn’t look so good when they’re holding pieces of paper! Other than that, why do some people choose to be on the back row and others on the front? It’s an understandable reaction for people who are less confident or new to a choir to avoid the spotlight. Hence they often end up on the back row. Their tendency is to be as far away from the action as possible. I have even seen them backing away from the choir so there is a huge gap between them and the ‘real’ back row! However, this obvious tendency is counter-productive. The back row should be reserved for those who really know what they’re doing since there is very little reinforcement of the part from other singers. In contrast, the front row is the place to be if you’re not sure since you can always see and hear the conductor clearly and you have all the other singers singing your part into your ears. Dawna Markova and Mary Jane Ryan (Can you become a creature of new habits?) have identified three zones of existence: comfort, stretch and stress. The comfort zone is where we usually live and is the realm of existing habit (see Fighting habit and complacency). It is where we feel safest and most familiar. However, if we constantly stay in that zone then we are unlikely to learn, grow or develop. At the opposite extreme, stress occurs when a challenge is so far beyond current experience as to be overwhelming. So we don’t really want to go there very often! It’s the stretch zone in between the extremes – activities that feel a bit awkward and unfamiliar – where real learning and development of skills occurs. So if you are an under confident singer in general, or just not sure about the song that we’re learning at the moment, don’t stay at the back. Step up your game to where your colleagues can help and support you, but maybe not right up to the front. Move into the thick of things into the middle row where you can stretch yourself a little whilst being supported by those around you.